I have been researching in the attempt to talk myself out of another build-specifically a Mongoose. I happened upon this article and was wondering if I am missing something. According to this, a 20" Mongoose will run with a .243 (16-18") using 80-90 grain fodder. (I realize that most .243s have longer barrels). Am I missing something or should I plan on ordering parts now? I too once researched a mongoose........ Just finished cerekoting my 20" build! My advice...... just build one you will like it. It runs 80-90gr pills easy- check out the mongoose section for better details on loads though, I'm pretty new to it yet. ....not helping the cause...or my finances! I am trying to decide between a Grendel or a 'Goose actually. I know they are different animals but which one will suit my "needs" better.. BTW, There is probably enough load data on the Mongoose that a load spreadsheet may be warranted....hint hint. Thank you. And I thought I had read every post on here at least once! You are not helping either!!! Since when has anyone here been talked out of building something? I know...wrong group to ask! Mark piqued my interest several months ago with his 80 TTSX loading and I have been mulling it around since. The only caveat is I really like a melonite treated barrel so if I want one from MDWS it sounds like it will be a while. I realize I will probably never shoot-out a SS barrel- but I am willing to try. I could "afford" to shoot-out a Mongoose....quality brass and projos for a Grendel might break the bank. Ok " high I am addicted to AR platforms " i was just cruising the internet and some one said come in just to talk............. OK build two go for the goose! There is no support group like this one. Sorry, I'm no help to talk you out of it. I had to have a pair so they wouldn't get lonely you know. There is NO point trying to talk yourself OUT of building the coolest 6mm rocket launcher on an AR15 platform! Alright...I will comply! But.....since your the one that might be able to answer my original question-will a 'Goose really run with a .243 when 80 or 90 projos are used? Not quite. I can get 3040 fps with the 80gr Nosler BT using AA2230 in my 22" barrel. The 243 Win can get 3300-3400 fps with the same bullet and barrel length. It's about as good as you can get with the 5.56 case, but the case volume of the 243 is going to beat it. Riggs - I don't own or shoot any .243 Win rifles (I have dies and have loaded for friends though), thus I have no "real world" experience to compare the Mongoose and .243 Win. From a purely theoretical perspective, even using factory ammo, the .243 Win should be able to out-perform the Mongoose. Just like a .308 Win will always outperform a X40 and a 6.8SPC a .277 WLV. The real question is how close do the smaller case MSR Wildcats come to their big-cased relatives? 80%, 85%, 92% ??? In most instances, we are getting very close to the "classics" with lots less powder (which means less recoil and better economy) and doing it in the AR15 MSR platform with minimal component changes. Riggs - From a purely theoretical perspective, even using factory ammo, the .243 Win should be able to out-perform the Mongoose. The Grendel is a great, field proven round with a lot going for it. Considerable downrange power, factory ammo, easily purchased brass, and if you build a Beowulf, think of the epic battles you will have in the gun safe! You can also fire form your own brass from brass AK rounds. That said, you need a special bolt and special magazines to run it, as well as 6.5mm bullets, which, unless you are already shooting them, adds to your start up costs. I've got two 243s kicking around for the kids. I also stumbled on Uber cheap 86gr Nosler eTips that should keep me shooting for the rest of my life (unless I ONKY shoot the Mongoose, but where's the fun in that?). Want to be economical? Buy your Grendel upper from Radical Firearms or Hardened Arms. Radical sells through Primary Arms and Joebob Outfitters as well as their site, and periodically has 20-22" stainless match grade barreled uppers with a hybrid keymod/quad rail designed and built by Seekins WITH BCG for about $500 (I bought an entire rifle complete with Ergo grip and LUTH-AR adjustable stock for $800 on sale--thing is a TACK driver!). Hardened Arms just started with the Grendel in January or late last year--also about $500 on sale for a 20" if I recall correctly. Both RF & HA are inexpensive AND solid performers! I bought my stainless 300 Blackout upper with BCG FROM them for $325 on sale--shoots sub-moa all day long--and an 18" 1:9 556 upper to be my coyote gun for $225 on sale. Stocked up on uppers for the kids (16" melonited 1:7) for $180 on sale. Got a 1:7 match grade hand-lapped stainless upper from Radical Firearms (with the Seekins handguard) that I bought with BCG FOR $300 on close out, and, as the description suggests, it shoots better than me. I swapped out the 12" quad rails on the HA uppers with US-made slim keymod handguards I got for under $100 each and was STILL money ahead, PLUS I had a quad rail to put the Blackout my oldest and I built together after Christmas. Both RF & Ha are 100% US made--RF in TX and HA in WA. Find the best deals and sales with a little patience, and you'll have TWO rifles for the price of one (or maybe a bit more, but hey! Two rifles!). I could find all the parts for the rifle minus the barrel and optic for under $600 easily--all US-made, all solid quality. I even found a Weaver Grand Slam 3-10x40mm scope for $150 new on eBay (same deal on Amazon--close out model that listed for over $500 initially!). Go get yerself some! It is without a doubt the best deal I've seen yet on scopes (says the guy that got his 4200s for the same price). It's in the same class as the Leupold VX-3 or a high-end Monarch. I've got a Super Slam and it is far and away the best glass I have--over the Zeiss Conquest, Bushnell 4200s, or Leupold VX-2s. Mongoose barrels are the next in line after the WLV. Will not be a very long wait at all. With the recent release of the Mongoose barrels, I have decided to "crawl into the den". What is the recommended set-up for a Mongoose? ie: Is an adjustable gas block suggested? Buffer weight? just get the barrel and you are good to go no adjustable blocks needed or special buffers. OK, I made the leap but I have a couple questions. I sized my cases using BIGGDAWG's method and it worked great! Fired cases measured + .007 - I don't think I want to "fine tune" this any closer due to potential spring back variances. I am ejecting at 5:30 and did have some feeding issues as a result. Some of the feeding problems, I surmise, relate to the "donut" and my mags not playing nice. I am using a standard carbine buffer and spring (I don't have the actual weight due to my scale range resolution) and I am SURE the gas block is aligned properly. Could this short-stroking be due to the reduced charge? 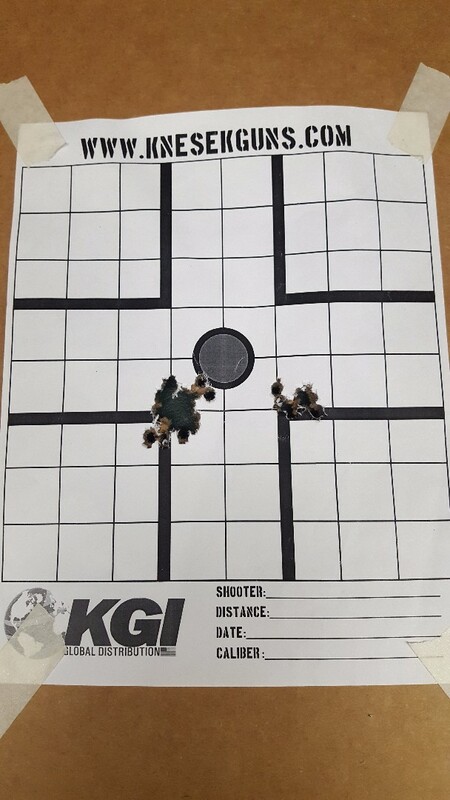 tac and the shots -- tac is a little slow but 30 grains shows about 50k and a slight compressed load in quickload. so 29 or 30 grains would be a fire form load for me and should cycle the gun.